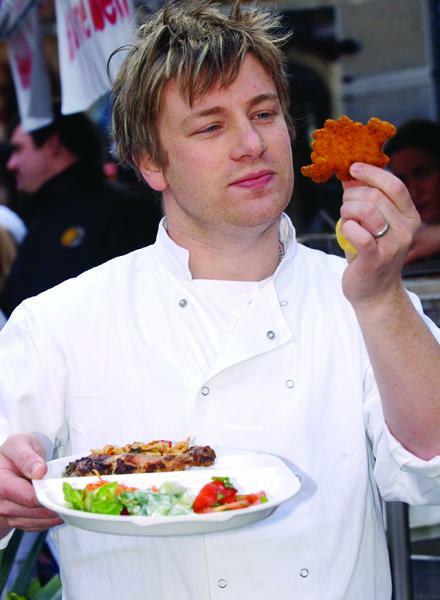 Jamie Oliver is a bit of a strange one – it seems people either like him or they seem to hate him with a passion. Personally, I like him; he’s the cheeky, chappie with a clear mission to change the way people think about food and hopefully make a conscious decision to eat healthy – which lets face it, is the goal of every TV personality chef. Jamie though seems to do it in a more public way (compared to say Gordon Ramsay who is generally off transforming failing restaurants into cash making machines), such as the past two campaigns he’s done in the UK; the school dinner’s project and his food revolution for healthy eating. The latest series showing on Channel Four has been “Jamie’s American Food Revolution” and I have to admit I’ve been enjoying the show immensely, three episodes in I’m hooked in and supporting the mission, whilst at the same time being totally bewildered at the lack of common sense that is being applied to healthy eating in the States. Jamie has been hitting the schools hard as the first step in educating at the root levels, however despite getting the inevitable backlash from the cooks who refuse to make meals from scratch (read; lazy), his main challenge has been fighting the system that seems to be made up of incomprehensible rules. The example last night was a secondary school (or ‘High School’), lunch time – Jamie made a stir-fry chicken which included 7 different fresh vegetables, however the other meals on offer didn’t satisfy the requirement for a minimum number of vegetables that should be on offer, which does sound reasonable – if you don’t want stir fry, an alternative should be provided – however when Jamie asked if French fries would be classified as a vegetable the reply came back in the affirmative, that French fries, despite their high calorific content, were a potato staple. In another episode Jamie asked a bunch of kids (6 to 7 year olds), to identify different fruits and vegetables put in front of them – the results were outstanding – not one kid knew any of them, yet as soon as he held up the chicken nuggets and French fries, they instantly identified both items without any hesitation. This totally shocked me – America, the world’s greatest superpower – doesn’t teach their kids anything about staple ingredients and healthy food types. Now, I’ve watched “The West Wing”, I know that education and healthcare is always up as a topic of conversations for the American Government, how could they have missed this obvious concern in the health of their people? Admittedly, the UK have faced similar problems in healthy eating campaigns and school dinner campaigns, but in a country as advanced as America, you’d instantly assume that someone would have looked at these issues and fixed the problem at root cause before a cheeky, London based TV chef arrived in their country to point out the obvious.